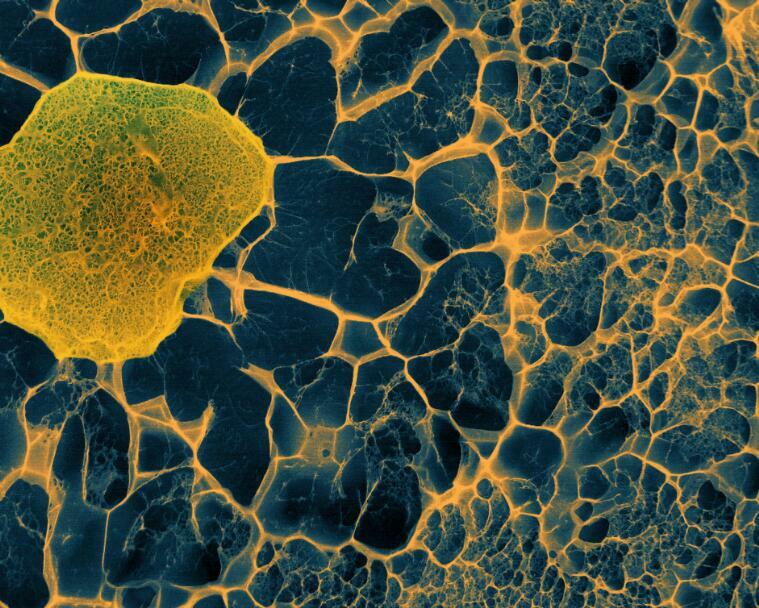 False-coloured cryogenic scanning electron micrograph (Cryo-SEM) of a single human stem cell (left of image; yellow) embedded within a porous hydrogel matrix. The structure and properties of the hydrogel matrix were designed to mimic those of the cell's native environment in the bone marrow. Imaging stem cells in a 3D environment provide valuable insight into the bidirectional physical interactions between a stem cell and its 3D niche. The hydrogel is composed of thiolated hyaluronic acid cross-linked with poly(ethylene glycol) diacrylate. The diameter of the cell is approximately 15 micrometres.